A cross-functional map has the departments or groups listed on the left. In the chart above, Marketing, Management, and Web Design Team are listed. The first step is "Propose changes to Web site." It is listed to the right of the Marketing group to show that the proposal came from Marketing. If a box is in the "swim lane" of your department, then you are responsible for it. The next box is "Evaluate changes" which is done by Management. The arrows between boxes show what is transferred. These are the inputs and outputs of the process steps. Management gets a document that proposes changes to the Web site. 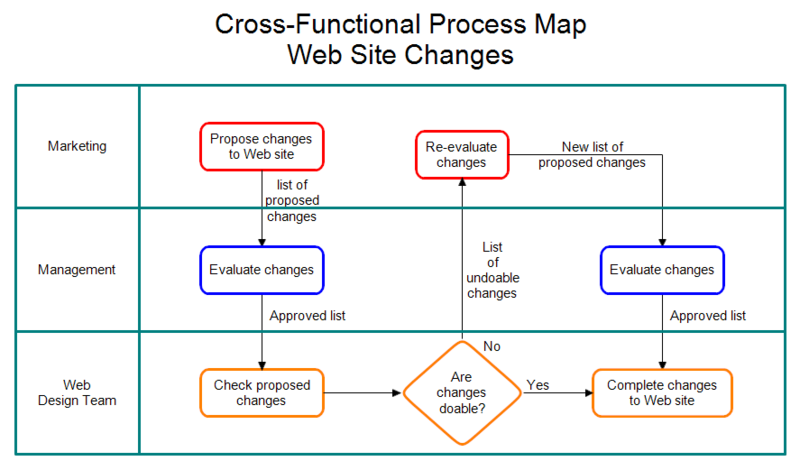 You can have decision steps in your cross-functional map as shown above. A decision results in flow branching in two or more directions. In the chart above, the design team must decide whether the proposed changes to the web site are possible. List the functions on the left. These are usually departments, but can be people, groups, sections, divisions or whatever. Draw the swim lanes so we know who is responsible for each step. Once RFFlow is installed, you can open the above chart in RFFlow by clicking on cross-functional-map.flo. From there you can zoom in, edit, and print this sample chart. It is often easier to modify an existing chart than to draw it from scratch.